Lichen planus is a disease that can affect the skin and any lining mucosa. This could be the oral, esophageal, vaginal mucosa as well as the skin. Often, it is found only in the oral cavity. Overall, lichen planus affects approximately 2 percent of the population. Although the disorder may occur in all age groups, women over the age 50 years are most commonly affected. The cause of lichen planus is not completely understood, but genetics and immunity may be involved. Findings suggest that the body is reacting to an antigen (i. e. an allergic type reaction) within the surface of the skin or mucosa. Some authorities think that lichen planus is an autoimmune disorder in which the skin cells lining the mouth are attacked by the white blood cells, but more research is needed. Others classify lichen planus as a cell-mediated immune response and believe that since a specific antigen has not been identified, it is premature to classify the disorder as autoimmune. 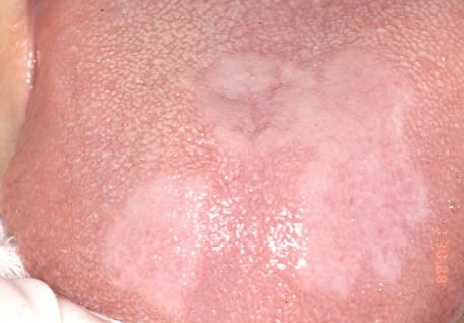 Lichen planus can appear in the mouth in several different patterns. 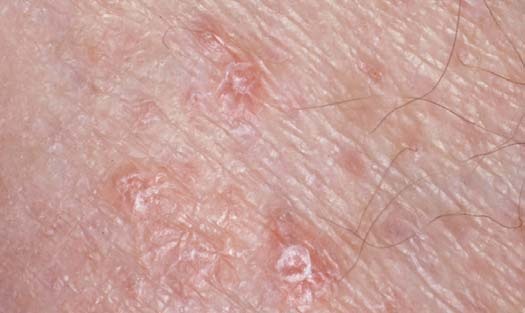 The reticular pattern (see right) is commonly found on the cheeks as lacy web-like, white threads that are slightly raised. These lines are sometimes referred to as Wickham’s Striae. The name lichen comes from a plant that is often seen growing on rocks with its mossy, web-like appearance. 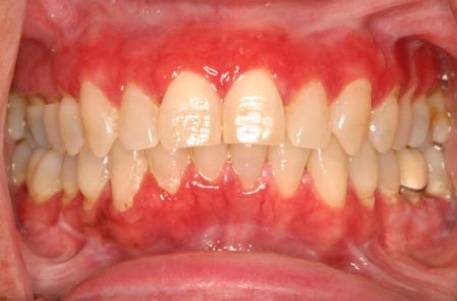 The erosive (atrophic) pattern can affect any mucosal surface, including the cheeks, tongue, and gums (see left). 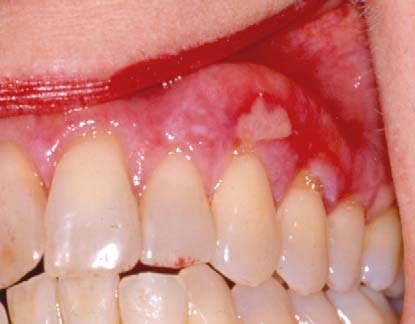 This form often appears bright red due to the loss of the top layer of the mucosa in the affected area. In most instances, individuals with erosive lichen planus are uncomfortable when eating and drinking, particularly with extremes of temperature, acidic, coarse, or spicy foods. In severe cases, ulceration can develop (see below Left). Individuals affected by ulcerations may experience pain even when not eating or drinking. A less common form of lichen planus is the plaquelike lichen planus, which appears as a dense thickening of the mucosal tissue (see below Right). Lichenoid reactions are instances of mucosal disease that resemble lichen planus both clinically and microscopically, but are due to an allergic response (see Right). The list of potential offending agents is extensive and includes medications, oral hygiene products and occasionally, metallic filling materials placed by your dentist. Identifying the underlying cause of a lichenoid reaction is often challenging, but when successful leads to lesion resolution. The severity and subsequent disability caused by lichen planus varies from inconsequential to severe. Skin lesions are typically present as a purple to brown in color, raised rash that can be very itchy (see Left). In addition to the oral mucosa, other mucosal surfaces such as the eyes, esophagus, and genitalia may be affected. Q: How do I know if I have oral lichen planus? A: The diagnosis must be obtained from a qualified health care professional. Usually, a biopsy is advisable to establish the diagnosis and rule out other diseases. Q: I have oral lichen planus and my mouth hurts each time I brush my teeth. How do I avoid this? A: Often with oral lichen planus, it is necessary to use a mild tooth paste with a minimum of flavoring and other ingredients. A soft tooth brush is essential. Q: What treatment is necessary for oral lichen planus? A: Often the reticular form of oral lichen planus does not require any treatment, except periodic observation by a health care professional. The erosive and ulcerative forms can usually be controlled with the use of topical corticosteroids. In some cases, systemic steriods or other medicines may be prescribed by your doctor. Q: Does oral lichen planus go away with treatment? A: Oral lichen planus is a chronic disease that can be controlled but not eliminated. A goal of therapy is to convert bothersome erosive or ulcerative oral lichen planus to the asymptomatic reticular form. Individuals with oral lichen planus often require some form of maintenance therapy to keep their disease under control. Oral lichen planus can be controlled but often will exhibit disease flare-ups requiring additional. Finally, following a healthy lifestyle consisting of a well-balanced diet, exercise and stress reduction is also beneficial. Q: Is oral lichen planus contagious? A: No. Your partner or family member will not be infected by oral lichen planus and you did not catch it from anyone. Q: Can oral lichen planus lead to oral cancer? A: This association remains controversial, but there are reported cases of this occurring. This concern reinforces the essential need to obtain an accurate diagnosis, typically with a biopsy. All patients with oral lichen planus should have a periodic evaluation to asses the efficacy of therapy and to monitor for suspicious changes. If your oral lichen planus does not respond to treatment or if you should notice a significant change, you should contact your heath care provider for further evaluation.